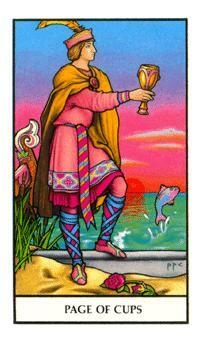 In the majority of European esoteric Tarots, the suit of Cups refers to the element water. The suit symbol is usually a large drinking cup or communion cup, like the mysterious Grail chalice, occasionally shown pouring forth with holy water or other sacred fluids. Associations with this cup include the Holy Grail; a fountain of love; the Cornucopia, containing all good things that make us happy; the Krater, stone cup of the Mysteries, containing Soma, psychedelic elixir of mushrooms and cannabis pollen; communion cup of the Catholic Mass; the Pomegranate cup of the Egyptian cult of Isis and the old Hebrew mysteries. ...It sometimes refers to the Blood Mysteries, symbol of the ultimate sacrifice, whether it’s menstrual blood, the blood of a sacrificed animal, or the blood of Christ. There are times when the cup is also used to symbolize sacred sexuality, with its connotations of merging and bliss. In each case the symbolism reflects the heart of life, bonding and nurturing support, deep soul satisfaction, and becoming one with a greater whole. Commonly, the Suit of Cups rules the psyche or emotional life, dreamtime, the lunar, tidal, monthly cycles of subjective experience. It refers to all aspects of the inner life, from fantasy and imagination to great heights of ecstasy, deep wells of grief, and the immense calm of spiritual security. This the world of feelings, the heart, our close emotional and spiritual ties. It represents all the ways in which people can be touched and moved in our nonverbal, empathetic, sensitive and intuitive natures. 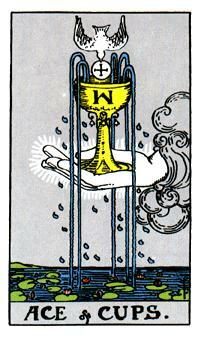 As the imagery implies, the suit of Cups is pregnant with meaning for Western esotericism. This suit has been used to carry the traces of an underground belief held in certain Gnostic Catholic circles in southern Europe about the lineage of a Holy Family founded by Jesus of Nazareth and his wife, Mary Magdalen. According to this belief, Mary of Magdala was taken to Europe along with her child/children after the crucifixion, for their protection during the troubles in Jerusalem. 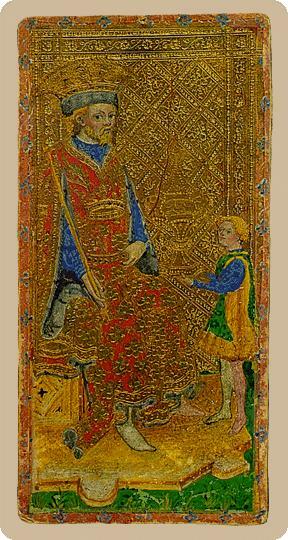 The family settled in southern France, founding a dynasty which eventually rivaled the Roman Church, provoking both the Crusades and the Inquisition as a result of Rome’s attempt to eliminate their influence in Europe. The queen of Cups is therefore regularly portrayed as the Grail Queen (see El Gran Tarot Esoterico), unambiguous icon of the Arthurian legends. If she is being indicated indirectly, she’ll become an idealized and dreamy Venus-like figure (see the Medieval Scapini Tarot), occasionally, the Black Madonna, patron saint of many villages on the Iberian Peninsula (the Alexandrian Tarot decks). Sometimes attributes of all three are present, as in a Black Queen with naked breasts who carries the Pomegranate Cup (Ibis Tarot). These various guises reveal her role as All- Woman, Sacred Virgin, Lover, and Mother, simultaneously a living woman and a reinvention of the ancient Great Mother, still beloved despite any overlay of patriarchal Christian dogma and symbolism. These Tarot decks are the most likely to imply that the cup is full of blood rather than water. If the cup in the hands of your King of Cups burns, bubbles, smokes, or flames, you are probably looking at a Tarot informed with a alchemical theme. This references a person who is actively cultivating spiritual powers (practices which the Roman church strictly anathematized). 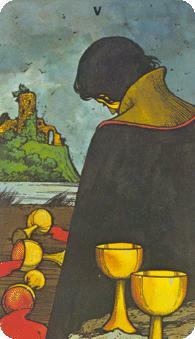 In those Tarots, the Page is often shown with his cloak draped over his cup or a lid covering its fullness, and with a downcast demeanor. He’s the royal heir, forced to live incognito, banned from his inheritance and his proper role in history. The Knapp-Hall Tarot goes to the length of showing his “lineage tree” broken in half behind him. 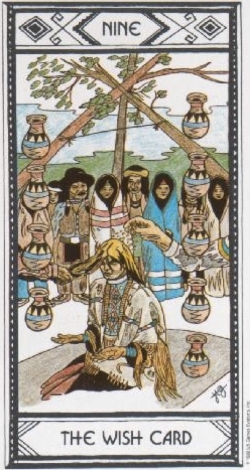 There exists a small group of esoteric Tarot decks that use the suit of Cups to symbolize the element air (the realm of the mind) rather than the element water. These are the Spanish-influenced or Iberian Tarots from Spain, Portugal, and the southern coast of France. 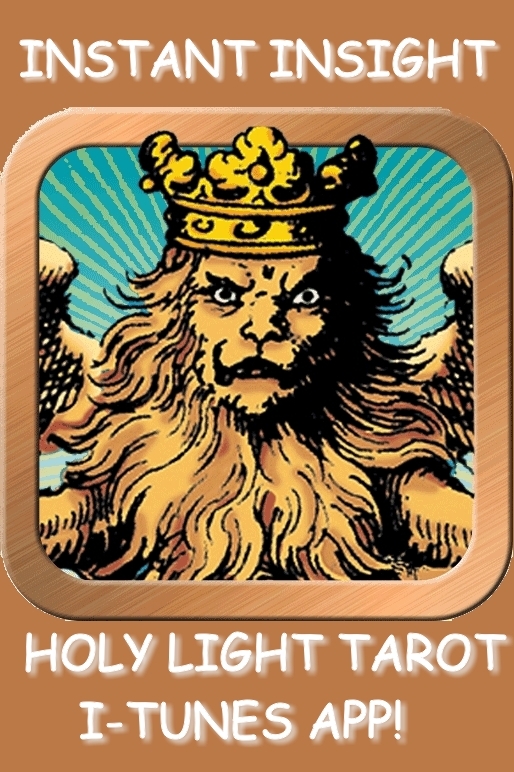 These Tarots relocate the Holy Grail away from the sentimental and emotional life, focusing it in the philosophical sphere, the realm of the mind. Here the Cup is a symbol of the Soul’s consciousness, receptive and open to Divine Inspiration, experiencing communion with higher planes and higher intelligence. It refers to subtle states of meditation and contemplation, an active, aware receptivity to the Divine Word. 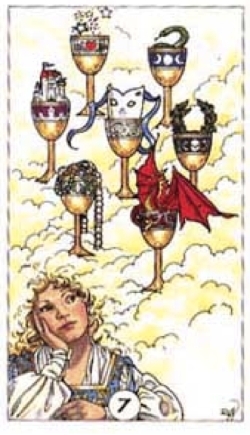 Such Tarots show symbols of the astrological air signs (Gemini, Libra, Aquarius) built into the designs of the royalty of Cups, and will also show a preponderance of butterflies, birds, insects and flowers adorning the suit of Cups, even sometimes extending over the whole deck. They also have a higher percentage of female images in the Major Arcana, with especially suggestive and sympathetic imagery associated with the Devil card. 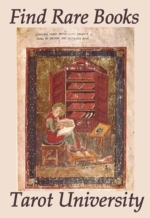 These clues imply contact with the most ancient Hebrew mysteries, carrying Gnostic, Alexandrian, and Moorish influence barely hidden beneath the ubiquitous Catholicism imposed from Rome. Examples of this family of Tarots are El Gran Tarot Esoterico, the Salvador Dali Tarot, Euskalherria, Balbi, and the Royal Fez Moroccan. This group of decks is the most colorful, most diverse, and most unexplored school of Tarot represented in the Tarot Magic selection. The Ace of Cups shows a hand holding up an overflowing cup, which fountains forth an endless stream of water, wine, blood, or soma for the people’s refreshment and healing. Classic associations with this card are; the sacrament of Baptism, a fountain of love and self-esteem, heart’s home, and the mystical Center. As such it is Paradise, or at least an opening to the path leading there. Being the prime mover in the suit of cups, this Ace represents the Dream of the Soul, a vision of the higher life that moves us deeply and can sweeten our lives if we surrender to it. This card is an unfailing source of balm for body, heart, and soul. It suggests that you can relax into a safety net of love, support, and communion. 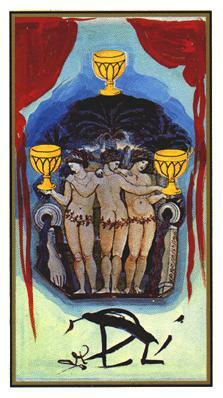 The Two of Cups signifies a union of soulmates, often with an Adam and Eve theme, traditionally described as a romantic relationship, but implying all partnerships based on affinity and deep mutual understanding. Sometimes it means that your mind and your soul are discovering each other, possibly for the first time. This card highlights a karmic tie between individuals, portrayed by a wreath or figure eight ribbon twining around the two cups. Occasionally you see a symbol referring to the union of alchemical opposites (dual cultivation, as in sacred sexuality), portrayed as a long-necked flask wound about with twined serpents, its mouth spouting flames, sometimes winged. This image indicates the refining and mutually completing effect of a true and lasting human bond. 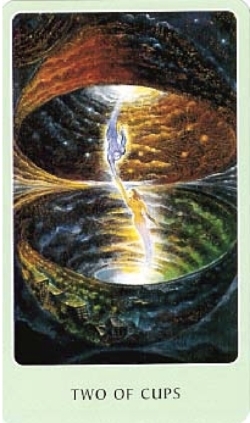 Even in a non-relationship context, this card will represent a fusion of distinct ingredients which come together to produce a unique synthesis. The Three of Cups, often called “consent” or simply “yes,” implies a spirit of agreement, mutual support, encouragement, and teamwork. Regularly pictured as three women celebrating their friendship in a dance with lifted cups, it can be called “sisterhood,” a mutual admiration society. It represents all the benefits of harmonious peer relationships. One can also read family bonds from this card, either by blood or by choice. In this little group, a strong sense of approving recognition pervades. There is a sweet and accepting emotional tone which allows the participants to relax and share visions, creative thoughts, and healing strategies. For this reason, the term “support system” provides an easy catch-phrase for this card. The Four of Cups refers to a restless time, such as when a person feels dissatisfied with life and emotionally uncomfortable with friends and family, habits and routines. Feeling stagnant and longing for change, the heart is questioning its options, sometimes to the point of cultivating cravings for distraction and fragmentation. There is also the occasional dull trance of oblivion that settles in when the emotional waters are not flowing smoothly for some reason. Symptoms include loss of motivation, fitful meandering among the inessentials, toxic and self-polluting habits, and a vague presentiment that something is not quite right. Make every effort to awaken yourself from this drifting, passive state, before the ship of state washes off course! Get back in touch with your personal mission, so you can come out of the swamps and proceed with a clearer sense of direction. The Five of Cups traditionally portrays the mess that is left after an emotional upheaval, such as a tantrum or fit of rage. Consequences run the gamut from a hangover and lost wages, to abuse and ruined relationships. Hence one of the oldest associations with this card is the warning against letting emotions get the upper hand. The traditional title, “inheritance”, further suggests the cross-generational legacy of broken families and abandonment. These same interactional patterns magnified to tribal and national dimensions can ravage the peace of nations. Interestingly, this card’s design will often reveal the relative optimism level (or lack thereof) of the deck’s creator, depending upon how many cups are shown unspilled. Obviously the potential for regrets will be high with this card, even if it is not reversed. The more one concentrates upon the resources remaining to be tapped in the unspilled cups, the better, or else valuable time and energy will be lost in finding blame and “crying over spilt milk”. The Six of Cups represents a refreshing openness and innocence, a willingness to learn, and an optimism that things will get better as we grow together in understanding. The traditional title “The Past” reminds us of our original natures, when we were young and enthusiastic, when anything was possible and the future was an open book. We are to remember that this same freshness, those new possibilities, are always with us, even now. Further key concepts include; memory and nostalgia, vacation times, playfulness and simple pleasures, trusting your inner child, and uncomplicated relaxation given to yourself as a reward for work well done. Often the image will show several children playing in a safe and natural environment, free of fear and coercion. Perhaps it is time to pass on the responsibilities to others who can carry the load, and just go to the beach! The Seven of Cups typically refers to works of the imagination, the use of dream, desire, and even magic to invent a future different than the life one is currently living. This card reminds us that our outcomes are not set in stone. We can raise our hopes and expectations and thus upgrade our results. Do not be fooled by the traditional title “Fantasy,” for this card indicates the magical quality of the awakened imagination. A better title might be Vision, because that is what this card invites and represents. Some people are afraid to admit their heart’s desire, even to themselves. Yet by being self-compassionate enough to truly feel our real feelings, at least in the privacy of our own hearts, a current of energy is set up that will slowly and steadily bring the world into closer harmony with our dreams. This Seven reminds us that there are invisible currents we can harness to our wills, even when the visible methods don’t seem to be working. 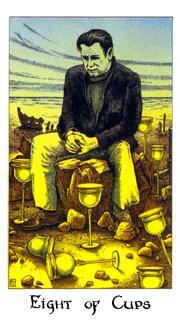 The Eight of Cups is often used to signify a great disappointment, an emotional setback, betrayal, an injury to the heart. 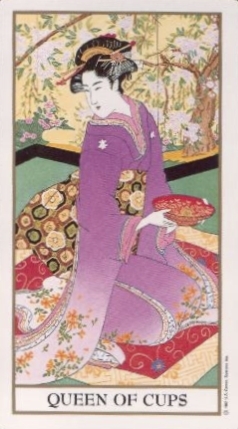 Some Tarot decks illustrate this principle by showing a young woman who has just been molested and then cast aside by a stranger passing through her village. This selfish and heartless act has left her vulnerable, with potentially drastic consequences. 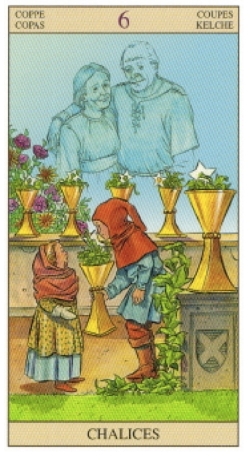 The Nine of Cups is traditionally called “Happiness.” This card often shows the innkeeper on a Saturday night, doing a brisk business and grinning broadly at the thought of his profits. The rewards are not all monetary, however. The context can include music, dance, food, socializing, and aesthetic appreciation of the finer things. The circumstances shown on the card will vary, but the constant of every appearance of this Nine is emotional satisfaction, a sense of belonging, and being in company with favorite people. This happiness reflects the fact that you are living right, you are loved, and you are recognized for the beauty and bounty you bring to the world. 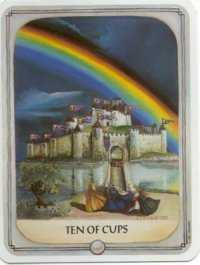 The Ten of Cups traditionally extends the personal happiness portrayed by the Nine, to the whole tribe, congregation, or nation. This celebratory scene usually bonds all the generations, crowned by a rainbow signifying the end of hard times and a covenant with Divinity. Love and support extends in all directions, in a grand webwork of interconnected lives, inclusive of all. In this landscape, there is a place for everyone. As befits all the Tens, we are at the end of the cycle of Cups, and the heart is full of feelings reflecting the tidal fluctuations characteristic of this suit. Following mystical associations long held with the rainbow, this card reflects communication with the collective Higher Power, guides, and nature spirits. Perhaps the assembled throng is lifting their voices in sacred celebration of their bond with Nature and all of life. 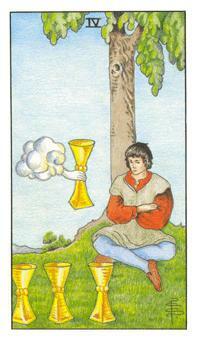 The Page of Cups represents a poetic, mystical, emotionally open and impressionable young person (or at least young-minded). For whatever reason, this person’s dreams are still tender and idealistic, still given to flights of imaginative fantasy, still magically inclined. This Page may also be an empath, implying access to a realm of felt realities that others only imagine. Exquisitely refined and fine-tuned on some levels, the Page yet lacks a sense of groundedness in ordinary reality. His practical experience-base has not yet entirely filled in, leaving him or her with blind spots that can prove discouraging. Easily drawn hither and yon by forces from the environment, our Page must learn to give more balanced attention to this hardedged, literal world of consensus reality. A good goal would be achieve a stronger will and a more calculating mind to balance all that watery formlessness. 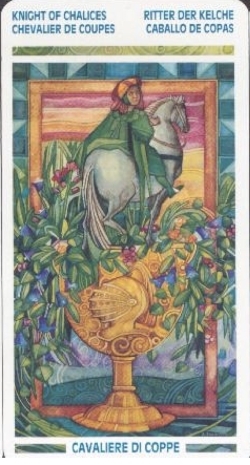 The Knight of Cups has quite often been titled “Homecoming,” indicating the long journey traveled to find his true heart’s home. Completing the journey of return after long estrangement from all he once held dear, his taste for adventure is exhausted—there is no more romanticizing of battles or travel in strange lands. Now he wants to live in peace where he will be recognized, wanted, and welcomed, where he doesn’t have to fight at every turn. He is now older and wiser, the prodigal son. Another regular association with this card is that of Knight of the Heart, exemplar of the chivalric and courtly culture born of the Arthurian story-cycles. Thus he can be seen as the romantic hero, the knight on a white charger come to right the wrongs and rescue the little people. Care must be taken not to over-project on the actual person this card may represent, however. This Knight is, after all, the Page grown up, now riding the horse instead of walking beside it. This knight retains his compassionate heart and psychic sensitivities, however warrior-like he has become towards the world. At her best, she represents the Grail Queen and the Goddess of the Family. The proof of her fulfillment comes upon witnessing that she has awakened compassionate responsibility in her loved ones, thus infusing the world with loving family values. Associations present in the Egyptian-style decks point to this Queen as a Shamaness, mixer of spiritual medicines, and guide of souls into the Mystery realms, therefore expert in trancework and all the psychic arts. The King of Cups is traditionally portrayed with a watery background, seated on a throne, holding the Cup of Mystery in his hand. Occasionally this cup is fulminating like the mouth of a volcano, emanating light and fumes, but never quite boiling over. The person referred to by this card is so deep that he or she doesn’t need to speak to communicate strength, passion, and commitment. The person on the card may be robed like a priest or shaman, indicating his function as Guide of Souls in the work of evolution. Intense and intuitive, he is a force to be reckoned with. In the family and/or leadership arena, this King is the Good Father, the strong leader who can cement a team together with his love and caring, but who will not tolerate works of heedlessness, competitiveness, or selfishness. Nobody wants to disappoint him, not because he will punish them, but because he can break their hearts with a single glance! His nobility of soul causes all who know him to become their better selves. Images on this site are provided for educational reference only. Many of the Tarot decks cited in our teaching materials are distributed by US Games Systems, Inc.